Standard hot shoe made of copper material; cold foot designed with 35mm king-size locking nut, easy to mount and dismount; coiled from the cable with the straight length of 1m, the TTL cord is of high elasticity. Photo shows a few of what we have, you are buying one (or more if you put a different number in the "Quantity" box when purchasing). 5477, SCA 312AD, INFRARED AUTO FOCUS DEDICATED MODULE, CANON (ONE LEFT). 3.5 mm jack plug to male flash PC sync with screw lock to provide a stable PC connection. Sync cable provides a stable connection for your flash triggers. Professional spring PC sync cable- can be extended to 1M. 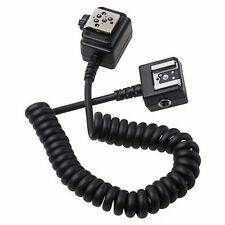 Genuine Nikon SC-17 TTL Flash Sync Off Camera Shoe Coil Cable Cord Tested! 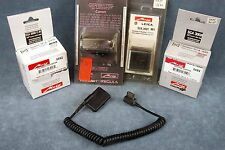 Genuine Nikon SC-17 TTL Flash Sync Off Camera Shoe Coil Cable Cord Tested!. Condition is Used. Shipped with USPS First Class Package. The distance between the centers of the two holes is 6mm. SC-17 TTL Remote. Extension Cable. No other accessories are included. This is a Pocket Wizard 804-608 PW-DC-N10. The other side can be attached to any stand, tripod, or device with a standard 1/4"-20 threaded stud or flash shoe mount. Maintains full TTL Connection. Works on all Canon Flashes and All Canon DSLR's. Compatible with all the Pocket Wizard Product ( PocketWizard Plus, PocketWizard II, PocketWizard III as the pic shown above). Flash or PocketWizard NOT included. PocketWizard 804-703. Belt Loop and Carabiner. Two Pockets. Features a shoe mount on the bottom of the flash connection shoe, as well as a 1/4”-20 socket. 3 feet heavy-duty coiled cable. Those order will be cancelled without any notice. Typographical Policy: We are not responsible for typographical or pricing errors. Sync Cable, Male Mini to Household two prong blade. This 15-ft. POWERLIGHT SYNC CORD. Pocket Wizard 802-454 N10-ACC Nikon 10 Pin Camera Cable "NEW"
This cable has a V on each end so I think it's a real vivitar cable. I have not tested it but if it doesn't work I can send another one. Vivitar connection on one side and PC sync on the other. These are the AC7 804-705 RF Shields for Canon Speedlites. Use with the PocketWizard TT5's to prevent RF interference. Trending at $21.96eBay determines this price through a machine learned model of the product's sale prices within the last 90 days. Type: Male to Male PC Sync cord. If item is defective after 3 months, you can still send it back to us. We will send you a new one after receiving the defective item. We will be very appreciate if you can leave your real feeling here. 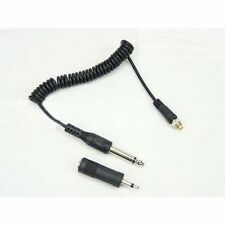 Type: Male to Male PC Sync cord(3.5mm). 1 x PC sync cord. The cable will work on most flashes that take a single pin plug. Warranty only apply on the stated warranty period products. 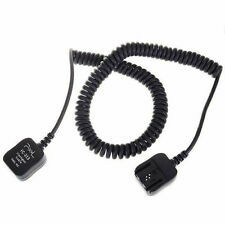 Flash Sync Cord for Pocket Wizard. PC Sync Cord Male to Male. PC Synch Cord with male-to-male connections. Also used by Pocket Wizard. 4mm Thick Heavy Duty Cord. It is fully compatible with the Speedlite Models 220EX, 300EZ, 380EX, 420EZ, 420EX, 430EZ, 430EX, 480EG, 540EZ, 550EX, 580EX, 580EX2. This cable has a 7 FEET heavy-duty coiled cord and features a shoe mount on the bottom of the flash connection shoe, as well as a 1/4"-20 socket. Length: Approx. Low price, no cost for a flash transmitter and receiver. If you do not receive our reply within 48 hours, pls. If you are satisfied with our service, pls. Description Approximately 12" 12 inch Plug to Male Flash PC Sync Cable Cord Features 1.Brand new and never used. 2.Type: Plug to Male PC Sync cord 3.Length: Approximately 30cm (12inch) Package Included 1 x Approximately 12inch Plug to Male flash PC Sync cable cord MPN Does Not Apply Brand Unbranded Connection Type 2. The other side can be attached to any stand, tripod, or device with a standard 1/4"-20 threaded stud or flash shoe mount. Maintains full TTL Connection. 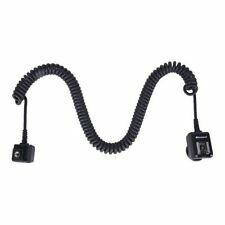 1 TTL Cord for Canon. Professional dedicated digital flash extension cord. Strobe Monolights with Standard Sync Port (RC100). WIRELESS FUNCTION: Built-in 2.4G Receiver with 16 Channels to avoid interference, The receiver has an on/off switch, and an LED to indicate triggering. Excellent condition and operation. Light usage - I'm the original owner. Appears unused, in original box. 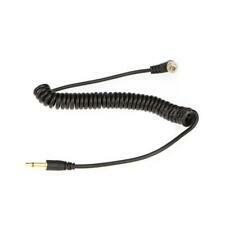 Genuine Canon Off Camera Shoe Cord 2. Condition is Used. Shipped with USPS First Class Package. 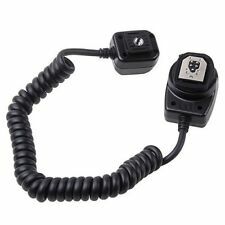 Olympus OM TTL Auto Cord 0.6m. Condition is Used. Shipped with USPS First Class Package. PC Male to Household. 4mm Heavy Duty Cord. Maintains Full TTL Connection. Mounts to Flash Shoe. Movo Photo is your source for high-quality audio and video gear. If the product has been discontinued, the warranty provider reserves the right to replace it with a model of equivalent quality and function. Photo shows a few of what we have, you are buying one (or more if you put a different number in the "Quantity" box when purchasing). 5548, STANDARD PC CORD FOR 32 CT2, 36 CT AND 32 CT3 (ONE LEFT). 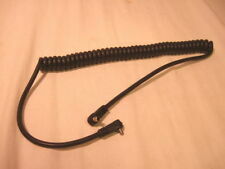 5526, 3' STD CORD FOR 45CT5 & 60CT1 2 - (ONE LEFT). But also can attach the flash receiver to the moonlight with it, it will work on most flashes that take a single pin plug. 3.5mm Plug to Male Flash PC Sync Cord Cable. ·1 x 3.5mm Plug to Male Flash PC Sync Cord Cable. Standard 3' ft/1m PC-PC Flash Synch Cord. Up for sale at KEH is thisNikon Nikonos TTL Sync Cord (SB102/SB103/SB104/SB105). Model: Nikonos TTL Sync Cord. Check-Out Now.